I really enjoy it and the coverage on Seven has been superb. My son who’s 16 can’t stand it. He’s constantly criticising their ball skills and how slow they are. And compared to the AFL he’s right. And to hear the commentators carrying on tonight about attracting players from other sports (as AFLW always has) is further confirmation of how this league is not really about the ‘footy’. But my son also reckons kids his age play better than these females. games are more high scoring, better to watch and are a much better display of footy. He has a good argument. Up until Under-13s or so, pretty much every local footy club would have one or two female players in it, who would often show up many of the other kids on the field - not saying they are the best on the ground, but competitive. Then, the systems we’ve had in place for years throw them out of the sport - you wouldn’t have a girls league to enter, they won’t let you play against the boys in most cases - so you were lost to footy. AFLW is playing an extremely important role - it is elevating the women’s game to be seen as a viable career path, proving there to be a future in it. That has already had a huge impact on the participation rates, and in turn, starting to make it so that there’s something to move on to once they get too old to play against the boys. There are converts from other sports, because that’s where elite female athletes turned when footy threw them out. It will take time for the effects of the AFLW to filter back in to the AFLW, but it wouldn’t have happened the other way around - you can’t just say “in 10 years Women’s football will be a professional sport” and expect young girls to be invested in that. Junior Boys footballers might be better in some ways - but Men’s football has existed attracting talented male players into the sport and creating the infrastructure around it to grow their skills, and the professional nature of the sport gives the elite players reason to stick at it, rather than switch codes in their teens. The women playing AFLW now haven’t all had that chance - and it is part of the reason for some of the skill gaps in things like marking and ball control. However, for other parts of the game, they are just going to always be different, but that’s fine - and makes a unique game, one that is far more focused on defence. As for why it’s on TV and junior football isn’t - people are watching. The AFL can’t make you turn on your TV, or make the thousands turning up to games go there. When thousands are turning up to watch your kid play junior footy, then by all means put it on TV. This is not really an argument. A lot of women’s sports teams play teenage males (football, cricket etc) because otherwise they can’t get quality games. Unfortunately, the skills just aren’t there yet. There are some very good players in the game, but going forward more money will need to be invested into this sport. Sevens doing a great job supporting AFLW, but long term this won’t be sustainable if the game doesn’t impore. I think we all want to see better quality TV content. Clearly from a ‘quality’ point of view, AFLW is barely adequate. When it comes to skills, ability and competitiveness, the AFLW seems to be somewhat over-rated and the ‘hype’ is mostly artificial. Unfortunately, the skills just aren’t there yet. And will they ever be? Young girls play footy as a bit of a social event. The boys take it seriously. The AFL can’t make you turn on your TV, or make the thousands turning up to games go there. Footy fans watch the AFLW because they crave footy this time of year. It would seem no coincidence that the WBBL wraps up prior to the AFLW. One wonders how these comps would go if televised head-to -head. The AFLW is great for the game. And I’m glad Gill brought it forward a few years. But it’s not great quality. The addition of new teams has only diluted the product, not enhanced it. It’s been too much, too fast. And it probably doesn’t deserve the exposure, resources and column-inches it currently gets. I’m not sure why anyone would expect AFLW to be the same standard as the AFL. It’s a young league. As others have said, once it’s filled with players who have moved up through a more formalised system, it will catch up. I’m not sure why anyone would expect AFLW to be the same standard as the AFL. Not sure anyone is saying that. But there are some saying it’s not even U16 Boys Rep level. The biggest issue this year isn’t the scoring or the skill level, but the lopsided conference system. We’ve just had a full cross conference round with the teams in Confrerence A (North, Melbourne, Bulldogs, Adelaide, Fremantle) all winning over the Conference B teams. So far it looks as though 5 wins will be needed from the 7 games in A to make the top 2 (so far Fremantle who are giving their men’s team a lesson in scoring are top, North and Bulldogs are also unbeaten and play each other on Friday Night in Launceston), where in the other group it could be that a negative record (3-4) may even be enough to get in with the bottom 3 teams in that group (GWS, Carlton, Collingwood) all winless and at least 2 of them will likely remain so after next weekend (GWS play Carlton, Collingwood play Fremantle over at Freo Oval). The skill level has improved dramatically over the past three seasons - but it’s unfair to compare it to the men’s game. A lot of women’s sports teams play teenage males (football, cricket etc) because otherwise they can’t get quality games. This is a really poor way to look at it - we need to support and grow womens sport (regardless of code) and this includes TV coverage (which is a massive risk especially for FTA, but the numbers are actually promising). If you don’t like the game, then don’t watch it. The biggest issue this year isn’t the scoring or the skill level, but the lopsided conference system. As a Geelong fan - I attended about 4 matches in the first AFLW season, but one of the biggest difficulties for me was that it just isn’t as enjoyable being a neutral fan, so I didn’t find myself going to any of the matches in the second season. This season got me right back into it - as now there’s my team in there to support, the matches and whole competition, take on more meaning to me. I’m watching more of the other games of the round just because having my team in comp has me more invested. I can imagine most people feel the same, hence such a push for expansion. The NRLW is probably a good counter example - the 4 teams and not expanding from there for a while - and even then only likely going to 6 or 8 - is very much closer to being in line with where the talent is. But then it makes the whole competition feel like an afterthought. I saw a Broncos v Warriors match before the Storm v Sharks prelim final last year and it just felt like an exhibition match, rather than part of a genuine competition. Also proved the Demons were very lucky to beat the Western Bulldogs last week. Tayla Harris trended at No.1 in Australia on Twitter tonight, all because of one photo. 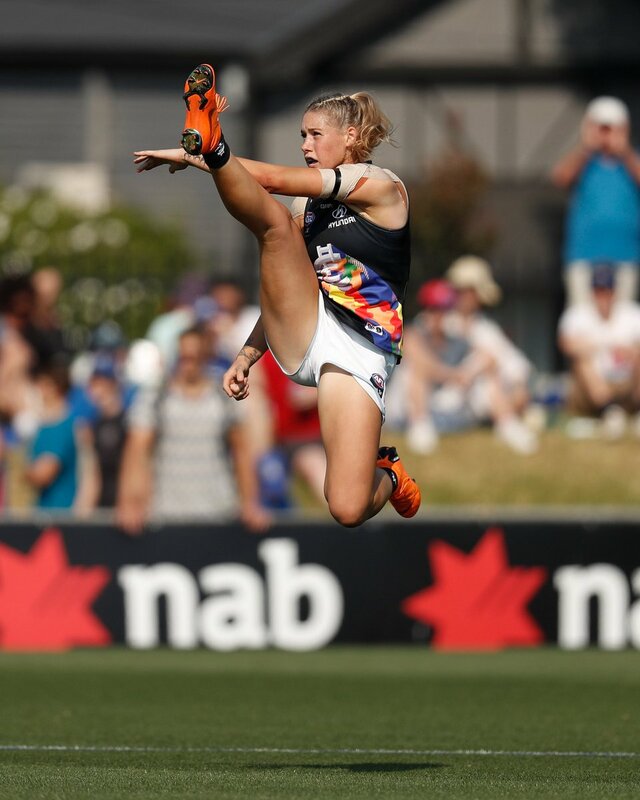 This afternoon, Seven’s AFL Twitter (7AFL) posted a photo of the Carlton star kicking for goal during her team’s win over Western Bulldogs on Sunday, taken by AFL’s Michael Wilson. It was a great photo I must say. However, that photo attracted hundreds of crude and offensive comments which caused 7AFL to delete the photo and the tweets altogether. That in turn drew condemnation from Harris herself plus many people in media and sports industry, who reposted that photo throughout this evening. The repostings received thousands of supporting tweets. Many of the comments made on the post were reprehensible & we’ll work harder to ban trolls on our pages. Our intention was to highlight Tayla Harriss’ incredible athleticism and we’ll continue to showcase and celebrate women’s footy. Sam Lane said on Seven’s pre-match coverage today that AFLW should move to spring-summer, with regular season starting on the first week of men’s AFL finals in September. While it’s a good idea, AFLW will clash against WBBL in October and November and also Seven’s horse racing telecast in October. There is also a logistics issue. 14 teams will compete next year so up to seven matches will be played each round. They will have share the use of some venues with local cricket competitions which usually begin in October. Also, can an AFLW match be played as curtain-raiser to AFL Grand Final? The Carlton Blues Women have booked themselves in the grand final after smashing Fremantle by 36 points. The Dockers and Blues played their finals for the first time and Carlton were in blistering form. Thing is, in its current format AFLW is killing state and local women’s footy. Very few players are dropping back to play regular season matches following the intensity of the AFLW season. It was a lopsided preliminary final at Adelaide Oval this afternoon, with Adelaide crushing Geelong by 66 points, the second largest winning margin in AFLW history. Geelong now has the unwanted record of being the first team held scoreless in the first three quarters of an AFLW match and an AFLW final, plus the lowest score in AFLW history. The Cats did not score until the 12th minute of the final quarter after Adelaide scored the first 67 points. Too embarrassing, North Melbourne (which had a superior win-loss record at the end of regular season) would have fared a bit better than the Cats. Surely the AFL must scrap the conference system next season. For comparison, according to AFL Tables website, last time a men’s team did not score in any three quarters of a VFL/AFL match was St Kilda, which failed to add to their quarter time score of 1.1(7) in their game against Carlton at Junction Oval in round 9, 1915. Last time a VFL/AFL team failed to score in the first three quarters of a match was Fitzroy against Footscray at Whitten Oval in Round 5, 1953. Adelaide will host Carlton at Adelaide Oval next Sunday (March 31) in the 2019 AFLW Grand Final. It looks like the match will be held after the men’s game between Gold Coast and Fremantle (4.40pm AEDT start). If confirmed it is bad timing for Seven because a night match will take viewers away from My Kitchen Rules in the eastern states. Surely the AFL must scrap the conference system next season. They can’t - it’s the only way they can limit the season to the current length. They should change the finals system though, take the top team from each conference and then the next two teams on a combined table. It will be hard again to have a balanced split given teams will again change significantly as more teams are added. Perhaps the future needs to be promotion/relegation rather than ‘conferences’ - then perhaps you could get a 6/7 team elite competition with weaker clubs developing in a lower pool - resulting in fewer lopsided clashes. Given this Geelong side did beat Carlton, you might just see some of those records broken next week.